Jeff Warner hails from an American folk dynasty that I could not do justice to here. 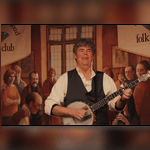 Suffice to say that he is a consummate performer who has a fine singing voice and can accompany himself on banjo, concertina and guitar. Come along for a wonderful American traditional evening. He loves to involve the audience so there will be plenty of opportunity to participate. My hopes are high that he will be bringing his dancing doll.